MARCUS Fraser is hoping his good form with Ross County will be enough to win a recall to Scotland’s Under-21 squad after last season’s crushing disappointment. The former Celtic youth player has started the new season in the same positive manner that won him a place in Danny Lennon’s squad to face Hungary last March. A hamstring injury forced Fraser’s withdrawal from the Budapest-bound travelling party, but the right-back, who turned 21 in June, is still eligible for a recall. The Under-21s are currently without a head coach but there is expected to be an appointment in time for September’s clash with Northern Ireland. While stressing that Ross County’s campaign is his main priority, Fraser clearly craves the chance to add to the five Under-21 caps he earned while still at Celtic. He said: “I’m still eligible to play at that level, so it’s an aim for me. There’s another squad selection coming up in the next month or so. “That would give me a good lift, but I’m just concentrating on playing well for Ross County just now. Hopefully, if I’m playing well here, other people will talk about me and then it’s up to them. “I was chosen last season for the Hungary game but suffered a wee hamstring niggle and it was a decision between Scotland, the managers and the physios to withdraw me from that. It was probably the right decision because I had to be fit for the games coming thick and fast here towards the end of last season. Coincidentally, it was another trip to Budapest – this time with County in pre-season – that Fraser partly credits for his club side’s good start to the season. A training camp and two friendlies in the Hungarian capital served to hasten the bonding process in a squad featuring 12 new signings. Fraser said: “We saw in the first couple of days of pre-season that everyone was together, having laughs and getting on well. The trip to Hungary also played a big part in it and was very good for bonding. Saturday’s victory over Hamilton has bred confidence, according to Fraser. He added: “It was good to get the first three points on the board. The boys did well. Tonight’s hosts St Johnstone have taken a solitary point from two matches but even in defeat by Hearts, they showed a certain resilience in storming back from 3-1 down to 3-3 before succumbing to a late goal. It was a similar tale on Saturday with Graham Cummins scoring late to salvage a point at home to Inverness. Fraser said: “I don’t read anything into their first couple of results. St Johnstone over the last few years have been consistent, a good unit, and I don’t see that changing. 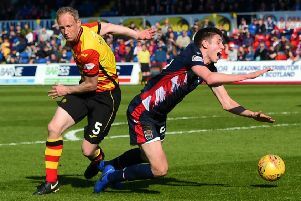 County manager Jim McIntyre, meanwhile, believes the Perth Saints offer a blueprint for what he would like to achieve in Dingwall in the next few seasons, given the consistently impressive finishes they have achieved in Scotland’s top flight on modest means. McIntyre, who has a fully-fit squad to pick from, said: “Billy Dodds and I both went down to see St Johnstone against Hearts. “They’re a threat, as they showed scoring three goals away from home in that defeat. They showed plenty spirit being 3-1 down and coming back. “They’ve got good players and have been, for me, a steady side for years. That’s exactly what we want to become. We want to be known for being a seven out of ten team, as they are. County goalkeeper Scott Fox played a pivotal role in Saturday’s win against Hamilton by saving an early Ali Crawford penalty. The former Partick Thistle and Scotland squad ’keeper exited the match in the second half through illness, but is fit to play tonight. McIntyre is at pains to ensure his players avoid falling into the trap of over-confidence after just one positive performance. He said: “When you have a good result, you’re looking forward to the next match. We know it is going to be difficult. “There wasn’t a lot between the teams last year. In the two games we played back-to-back down there, they dominated the first half and we dominated the second. There was just the odd goal in it.